Democrats in one race are striking different tones on checking President Trump. 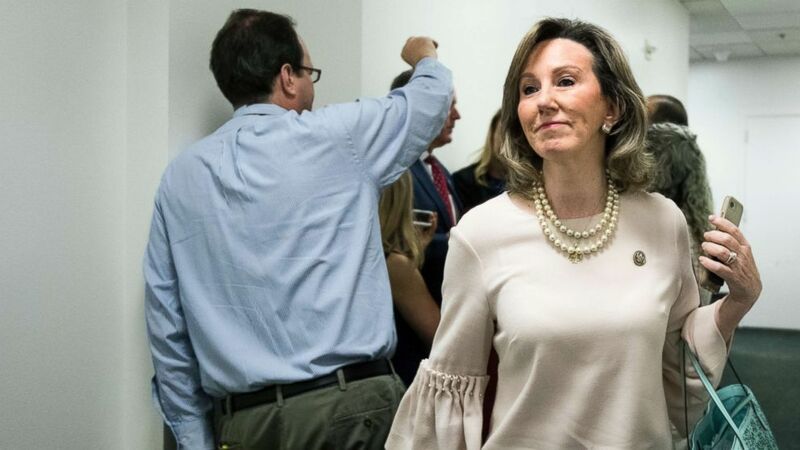 camera (Bill Clark/AP) Rep. Barbara Comstock, R-Va., leaves the House Republican Conference meeting in the Capitol, June 6, 2018. In Tuesday’s Virginia primary, six Democrats are vying to challenge the incumbent Republican, Rep. Barbara Comstock, in a highly competitive race just outside the nation's capital. Despite being an eclectic mix, all the Democrats in the race point to President Donald Trump - his conduct in and out of office as much as his administration’s policies - as a key factor in their decisions to run for Congress. (Jeff Taylor/AP) Candidates running in the Democratic primary for the Virginia 10th Congressional District seat participate in a candidates forum, Feb. 17, 2018, at James Wood Middle School in Winchester, Va. While they have focused their campaigns on health care, gun control and the GOP tax law - along with Comstock’s record of largely voting in line with Trump - the Democrats, in interviews with ABC News, differentiated themselves with various ideas about on how to best challenge the president and hold him accountable. It’s a question that remains on voters’ minds ahead of November: A recent NBC News/Wall Street Journal found that 48 percent of voters - and more than 50 percent of voters in competitive congressional districts like Comstock's - are more likely to support a congressional candidate promising to check Trump. 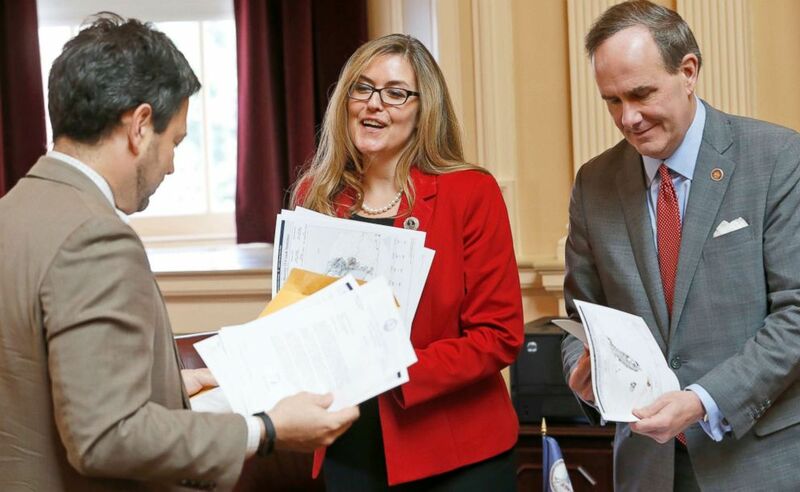 (Steve Helber/AP) Virginia State Sen. Jennifer Wexton, center, talks with Sen. Scott Surovell, left, and Sen, Lynwood Lewis. Jr., during the Senate special budget session at the Capitol in Richmond, Va.
One of the Democrats, Dan Helmer, an Army veteran and Rhodes Scholar recruited to run for Congress by the bipartisan leadership organization New Politics, grabbed headlines for a television ad comparing Trump to Osama bin Laden. Helmer went on Fox News’s ‘Fox and Friends’ morning program to defend his comments and accused Trump of not living up to his oath of office. “This is about a president who presents a grave danger to our democracy,” he told ABC News. Helmer said he would support impeaching Trump without hesitation, accusing him of violating the emoluments clause of the Constitution and obstruction of justice by firing former FBI Director James Comey. “Any one of these charges would be enough for impeachment and the president should have to answer for them in front of the Senate,” he said. Alison Friedman, a former State Department official who worked to combat human trafficking, said in an interview that she’s “always been motivated by standing up to abuses of power,” before accusing Trump of doing the same. “Congress isn’t honoring their constitutional responsibility to oversight and accountability,” she said. Friedman, who said she decided to run for office in part because Trump “scared my kids,” said potential Democrat-led impeachment proceedings in the House would be “one of the most serious moments in our nation’s history,” but wouldn’t commit to voting for impeachment without reviewing any impeachment articles. “I’m prepared to make that vote but I’m not prepared to make a vote on something I haven’t read,” she said. Julia Biggins, an infectious disease scientist running in the primary, also said she would wait to review the results of the Mueller investigation before deciding how to vote on potentially impeaching the president. State Senator Jennifer Wexton, the apparent frontrunner and only state officeholder in the primary, was motivated to take on Trump after seeing increased turnout at her town halls after Trump took office. “We came to realize that people were rising up and realizing that we can’t sit on the sidelines anymore, and I came to realize that I can’t do that either,” she said in an interview. Wexton, who attended the Women’s March in Washington after Trump’s inauguration and protested Trump’s first travel ban at Dulles International Airport, vowed to oppose Trump and congressional Republicans over policy disputes but also said she’d be willing to work across the aisle on shared priorities, including infrastructure. Wexton was also cautious when discussing Trump and possible impeachment. “We’ve got to not only be a strong check on this president but we also have to make sure that our government works to provide opportunities for all of our families,” she said.